Shouldn’t a 2000-square-foot house in San Francisco cost the same as in Omaha? If you answered yes, then time-varying electricity pricing won’t make much sense to you either. And you are probably puzzled, or outraged, at how much more expensive wrapping paper is on December 15 than on January 1. But if you recognize that a house in San Francisco is fundamentally a different product than that same home dropped into Omaha, then you will have no problem understanding why electricity should cost more at some times than at others. It’s the scarcity, of course. If you are a reader of this blog then you already know that electricity is really costly to store, so a kilowatt-hour (kWh) in the middle of the night is fundamentally a different product than a kWh at 3pm on a hot weekday afternoon. People want a lot more kWhs on hot weekday afternoons, just as a lot more people want that house in SF than in Omaha, at least compared to the much more constrained SF supply. If you forced the price of a house in SF to be as low as in Omaha, then you’d have many more people demanding SF houses than there are homes to be had. At Omaha prices, I know some people who would keep a place in SF just for weekends when they come into “the city” for culture (yes, here in the Bay Area we call San Francisco “the city”…apologies to New Yorkers and Londoners). You’d have to use some sort of lottery system to allocate the houses, or you’d have to scrutinize each buyer’s “need” for a house in SF or, as often happens with rent control, buyers would have to make a little “side payment” to the seller to be the one who gets the place. And if you forced the price of a house in Omaha to be as high as in SF, there would be a lot of nice, but empty, homes in Omaha. Pure waste. In the longer run, the good citizens of Omaha would just be crowded into smaller houses than they’d like — and should be able to afford — given the wide open plains of the Midwest. As bad as a housing shortage is, nothing creates a political firestorm like a shortage of electricity and the blackouts that follow. So, in electricity markets where all kWhs are priced the same, we avoid the blackouts by building scads of extra houses, uh, electricity generators. Someone has to pay for all that extra capacity; it gets rolled into the price of all the kWhs that are sold. And that too is a waste. 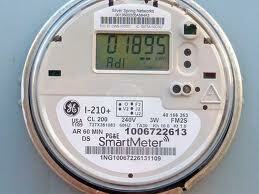 A smart meter. There’s probably one right outside your house. For decades, economists have argued that electricity prices should vary over time the way house prices vary across cities. With the smart meters that most residential customers in the U.S. now have – installed over the last decade — the technology is in place to do it. But some people just hate, hate, hate time-varying pricing. They want their electricity rate to be the same morning, noon and night, winter and summer, rain or shine or heat storm. Some economists have fumbled this problem saying, “too bad, these prices reflect the real cost, so deal with it.” A decade ago, I was one of them. That’s not the right answer. Prices vary for many things, but if you hate that volatility there is often an option to avoid it. The cost of having a car to drive today depends on whether yours was stolen yesterday, but you can pay someone to make that cost variation go away. Just as an insurance broker can offer you a product that eliminates (or greatly reduces) the cost variation caused by the risk of having your car stolen, a utility can offer you a product that eliminates the variation in your cost of electricity. Insurance isn’t free and neither would be the option to buy electricity at a flat price. If you want that time-invariant price, you’d be pooled with other people who want it. Who would those people be? Well, they’d disproportionately be people who consume a lot of electricity at expensive times, those hot summer afternoons. Would that make the time-invariant pricing option unaffordable? No. My own research has shown that even with a lot of this sort of “adverse selection” the flat price would increase by less than five percent. And a not-quite-released study by my colleagues at the Energy Institute and at Lawrence Berkeley National Lab (LBNL), which Catherine previewed in a blog in 2013, showed that there might not be much adverse selection at all. One key to a smooth transition would be to design rates that fairly reflect the cost of serving each type of customer, those who stick with flat rates and those who go with, and respond to, time-based variation. It’s easy to do, but regulators would have to resist pressure from some “consumer groups” who fight time-varying pricing, essentially arguing that we should continue screwing the majority of low-income customers in order to protect a few low-income customers whose bills would go up (and not by much, even for them). From the study by Catherine et al, it’s clear that another key is making time-varying pricing the default: you can actively choose to be on the flat rate, but if you do nothing you default to time-varying pricing. Defaults matter, because some people don’t pay attention and because some people who are unsure of which option to choose – whether it is retirement saving, electricity pricing, or getting a flu shot – go with the default option. And the study by Catherine et al shows that customers who defaulted onto the time-varying pricing overwhelmingly stuck with it even though they had the option to leave at any time. Time-varying electricity pricing has been a good idea for a long time, but it matters now more than ever. That’s because transitioning to greater use of solar and wind power will mean that it won’t just be demand that fluctuates in ways that are difficult to predict, it will also be supply. We can manage that uncertainty the old-fashioned way, by building more and more excess capacity, or the new techy but very expensive way, by investing in storage capacity, as Catherine discussed a couple years ago. Or we can first take the common-sense approach of using prices to let customers know when there is plenty of electricity available or when there is a potential shortage. We’ll still need some extra capacity and some electricity storage, but not as much. The savings from sending price signals would likely be at least hundreds of millions of dollars each year in California. One study from LBNL found time-varying pricing would dramatically increase the value of wind and solar power as penetration of those sources increased, a topic Meredith blogged about a year ago. And, as electric vehicles roll out, the opportunity to respond to time-varying pricing will expand exponentially. Cranking up your Tesla –uh, I mean Leaf or Fiat 500– charging when the wind is blowing, is technology that has already arrived. There really is an app for that. We just have to start using these technologies to save money and at the same time lower the cost of integrating renewable generation. Most San Franciscans don’t want to live in Omaha, and I bet most Omahans don’t want to live in San Francisco. The lower house prices in Omaha are one reward for not trying to be another tech worker in the city (…by the bay). Charging your car or running your laundry at lower cost should be your reward for using electricity when the wind is blowing or sun is shining. But if you don’t like that, no problem, there should be a flat-price option for you to choose instead. Think of it as Topeka. Note: After writing most of this blog, I found out that the California Public Utilities Commission will hold a forum to discuss time-varying pricing and other rate design issues tonight (Nov 16) in Stockton, CA. I think utilizing Solar and wind energy might help in reducing electricity cost, we just need to put extra efforts on that part. People with big houses and farm houses can even suffice themselves by installing their own unit. It might save electricity prices ( demand and supply)at some minute percent but it will surely help that specific home to not to have at least a blackout. Huzzah! I’ve commented several times on this blog about the need to give customers a fixed rate option as part of expanding consumer choice. I’ve expanded on those comments here on my blog: https://mcubedecon.wordpress.com/2014/07/01/rethinking-the-rates-that-utilities-offer-to-customers/. Many years ago, Severin wrote a paper about how airlines mixed long-term jet fuel purchases with spot market buys. One reason that Southwest weathered the oil price run up starting in 2007 was that it has forwarded contracted most of its requirements. That principle can be carried over the electricity customers as well. One factor in the increasing popularity of rooftop solar is that it provides a fixed electricity cost for several decades. MCE’s Local Sol rate similarly gives a fixed rate over many years: http://mcecleanenergy.org/100-local-solar/. One other consideration is that the CAISO market used to set time of use rates may be dysfunctional because of the mix of plant owners in that market. Too many are able to recover their capital costs through other means, either bilateral contracts or return on rate base, and the energy prices likely are depressed as the market becomes a place to dump excess power. As gas generation shares fall with increasing renewables, short term fossil plant costs become less relevant. In the utility rate cases at the CPUC we’re now debating how to incorporate incremental renewable contracts into the hourly price signals. Increasing storage that doesn’t have significant operational costs will complicate this further. All of this implies that TOU pricing may not be as transparent as it has been in the past. I’m never sure whether regulators and policymakers understand the economic fundamentals, and I don’t pretend to understand where their policy priorities lie. So it is with essentially requiring generators to bid their marginal running cost. Prices out of the CAISO market aren’t just dysfunctional, they’re meaningless. It doesn’t help that the auction structure is built around the traditional economic dispatch used for the kinds of older steam electric plants that are no longer being built and soon won’t even exist in California. I agree with Severin and other commenters on the need for time-based pricing to stimulate what I refer to as flexible demand To be useful in a grid that has more and more variable and uncertain supply, those prices have to be linked to system conditions that won’t follow the clock. However the way regulators have implemented their renewable energy policy virtually forecloses flexible demand unless the flexibility is enforced through arbitrary actions taken by a third party in the name of reliability. Couldn’t agree more with this article. In the long-term, managing demand is definitely going to be the most cost-effective way of running future energy systems: the “smart” bit of smart grid, if you like. You also wrote “That’s because transitioning to greater use of solar and wind power will mean that it won’t just be demand that fluctuates in ways that are difficult to predict, it will also be supply.”: I illustrated two examples of just this on my own blog last week: one extreme peak in pricing in the UK, and one negative pricing event in Germany. As you point out, there are ways to build your way out of these problems (storage, interconnectors and so on), but shifting behaviour and usage times will have to be a major part of the solution. Thanks for the post, really liked it! I just wanted to add that in Spain the government just enforced real time pricing (pass through of the wholesale day-ahead market price) for all consumers. It hasn’t been long since it’s working, but it would be interesting to understand whether bills have increased or stayed the same. Retail market in Spain is unregulated, so the customer always has the option to enter a fixed price contract with another retailer. Basically, the government made varying price the default by establishing the last resort tariff to be indexed to day-ahead market price. And even if market was unregulated a long time ago, a very relevant proportion of customers are still adhered to last resort tariff. However, the negative side of the coin in the countries in Europe were renewable penetration is high (such as Spain and Germany), is that the pressure of the regulators to increase the fixed part of the bill (the amount dependent on the power contracted vs. the amount proportional to the actual energy consumption) is pretty high. And that decreases the effectiveness of RTP as an incentive for demand response. Rate design tends to be a political problem rather than an economic problem, which is why regulators resist time-varying prices. Nevertheless utilities in such progressive states as Georgia, Illinois and Oklahoma have implemented time-varying pricing at one time or another. In Georgia it was done for industrial customers via a two-part pricing tariff that customers loved and Georgia Power found very profitable. In Illinois, dynamic pricing was implemented at the behest of consumer advocate Bob Lieberman. In Oklahoma, time varying prices for residential customers were implemented at OG&E’s initiative in order to deal with a combination of demand growth and their regulator’s refusal to approve new generating capacity. In the allegedly progressive state of California, a prominent, alleged consumer advocacy organization has been the principal antagonist. Several years ago it’s executive director complained in public to anyone who would listen that time-varying prices were really “heat wave” pricing, and as a result it was able to persuade the legislature to delay implementation of voluntary time-varying prices. California now faces the unenviable task of dealing with too much on-peak must-take supply supply during certain times of the year. Time varying prices would help avoid dumping those surpluses or curtailing renewable energy production. However given how slowly the regulatory process works in California, it could be as much as another decade before they are rolled out. The impact of time-varying rates on low-income consumers should be easy to study. I expect the result is that 75% or so would benefit, simply because, as a group, low-income consumers use less air-conditioning. Of course there are some with large usage, including those with inefficient homes and some with large (often multi-generational) families. The first problem, we can solve with efficiency programs. The second is more difficult. But Sev’s point, that we are screwing 75% of low-income households to protect a few whose bills would go up a bit, is probably right. Unfortunately, when utilities study this issue, they tend to look only at the impacts on those low-income consumers who participate in low-income assistance programs — which almost by definition is heavily weighted with the largest users. Millions of low-income consumers with modest usage don’t qualify or don’t choose to participate, because their energy bills are a low priority compared to other needs. Our recent publication, Smart Rate Design for a Smart Future, addresses this and many other rate design issues. We conclude that minimal fixed charges to cover billing and collection, a small demand charge to cover customer-specific capacity costs like transformers and service drops, and time-varying rates to recover shared capacity costs and energy costs will produce the best overall results for equity, efficiency, and predictability. The newly adopted rate design principles issued earlier this year by the California PUC do a nice job on this. A more recent publication looks at the impact rate design can have on the compliance obligation of the states for the Clean Power Plan. The difference between “good” rate design and “bad” rate design can be as much as 15% in usage. That’s enough to address about half of the CPP obligation.